Prepare to dominate fools as the Queen Bee. No, not Lil' Kim. With Mario Kart 7's December 4 release a little more than a month away, Nintendo took the opportunity to pump up fans by announcing two additional characters. She needs a bigger kart. First up is Wiggler, the happy looking yet dangerous caterpillar that has appeared in several Mario titles. 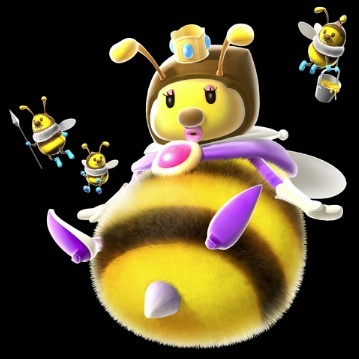 The second is Queen Bee, the humongous...well...bee, that made her debut in Super Mario Galaxy. Not sure how she plans to drive, or if Nintendo will shrink her down to normal size, but we'll find out soon enough.